Note: Cesaro ONLY has a Instagram and Twitter account. Any other accounts pretending to be Cesaro should be reported immediately . Note: Please be advised that Cesaro may or may not appear at all advertised events this is subject to change without notice sometimes. For More Information and Tickets, click here. Note: If you would like to be affiliated with us feel free to email at CesaroSource@gmail.com or tweet us @CesaroSource. Have you ever met the Swiss Superman or seen him live in action and would like to donate photos to showcase it in our gallery? If so you're more than welcome to share them with us please email us at CesaroSource@gmail.com or send us a tweet at @CesaroSource. You can also donate fan art, graphics, and more. Cesaro-Source.Com is a Approved fansite for WWE Superstar Cesaro. We are an approved source by Cesaro he is fully aware of the site and supports it, but we are not affiliated with World Wrestling Entertainment (WWE) or any other companies he has worked with. All photos, videos, or media found on here are sole property of the owners. All logos and trademarks are copyrighted to their rightful owners unless stated otherwise and is being used under The Fair Use Copyright Law 107. If you're using anything off of this site for your own personal use please credit us. This is a non-profit fansite made for fans by fans. Tom points out that the Usos are the first team in WWE history to walk into Wrestlemania as champions three years in a row. Black and Jey start, but then Sheamus fights his way in and goes to work on Black. Rusev tags in and turns Black inside out with a clothesline, then Nakamura tags in to dish out some punishment of his own. Everyone else has a chance to tag in and out until the Bar decimates practically everyone. Cesaro big swings Ricochet while Sheamus gives his forearm barrages to all the other opponents, then Cesaro gets Ricochet in the Sharpshooter. Another Pier Six brawl breaks out as everyone takes turns coming in to hit spots on each other, then they hit the Tower of Doom spot, and Ricochet somehow lands on his feet and rolls through to survive. Ricochet hits a 630 on Sheamus and makes a cover, but four guys come in to break the fall at 2. Back to hitting spots, and the Usos hit the Double Us for the win. Sheamus and Cesaro attack Kofi and Sheamus sends Kofi into the turnbuckles. Cesaro punches Kofi and irish whips Kofi. Kofi floats over and Sheamus is sent into the ring post. Kofi with punches to Cesaro and Sheamus with a forearm. Sheamus and Cesaro with a double single leg crab on Kofi. Cesaro with a European uppercut and Kofi is sent to the floor. Cesaro with a gutwrench onto the ringside barrier. Sheamus and Cesaro with forearms to Kofi. Sheamus is sent into the ring post by Kofi and Kofi sends Cesaro into the ring. Kofi goes up top and he hits a forearm to Sheamus on the apron. Kofi goes up top and is met with a Eurpoean uppercut from Cesaro. Cesaro picks up Kofi for a power bomb and Sheamus adds a clothesline from the turnbuckles. Cesaro holds Kofi for a Brogue kick from Sheamus. Cesaro pulls Kofi up when the referee starts to count. Cesaro holds Kofi up and Big E and Xavier Woods make their way to the ring but Rusev and Shinsuke Nakamura stop them. Rusev with a Machka Kick to Woods and Nakamura with Kinshasa to Big E. Sheamus and Cesaro hit a spike White Noise for the three count. WWE Smackdown Tag Team Champions The Bar vs. Shane McMahon & The Miz. Miz and Shane greeted Miz’s dad at ringside before the bout. Shane went right after Sheamus at the bell, chasing him out of the ring. Miz then controlled Cesaro early. Sheamus knocked Shane off the apron, allowing him to get control over Miz. Cesaro snapped Miz’s throat on the ropes as the referee admonished Sheamus. They attempted to put Miz through a table on the floor. Shane made the save and placed Cesaro on one of the announcers’ tables. Shane went to the top for the flying elbow but Sheamus attacked Miz, who was holding Cesaro down and drilled him into the ringpost. Shane dove off the top onto Sheamus. Cesaro nailed him with a big uppercut. Cesaro tossed Shane into the ring barrier. The Bar worked over Miz in the ring and scored a pinfall. Miz was worked over by Sheamus, trapped in an overhead hammerlock. Miz tried to fight his way out, but Sheamus blocked a suplex attempt. Miz was positioned on the apron and beaten across the chest with clubbing blows by Sheamus. Cesaro tagged in and scored a two count on Miz. Cesaro worked him over with a chinlock. Miz tried to fight away for a tag but was brought back to the Champions’ corner, where Sheamus tagged in and was stomped over and over. Miz tried to steal a pinfall with a rollup but Sheamus kicked out and drove Miz back into submission with a hard blow. Cesaro came off the top with an axehandle as Sheamus held him but Miz again kicked out. The Bar continued to beat down Miz. Miz finally made the tag. Shane cleaned house and teased Coast to Coast on Sheamus. Cesaro nailed him and did the big swing. Shane trapped him out of nowhere with a triangle choke and it appeared Cesaro was going to go down but Sheamus made the save. Miz returned to the fray but was clotheslined on the floor. Sheamus tagged in and The Bar nailed a double-team White Noise with Cesaro coming off the ropes to add to the momentum. Shane kicked up. Sheamus went for the Brogue Kick but Miz interfered and Cesaro was nailed. Miz took out Sheamus. Shane came off the top with a shooting star press and scored the pin. Move over Jushin Liger! Your winners and new WWE Smackdown Tag Team Champions, Shane McMahon & The Miz! Matt Hardy & Bray Wyatt vs. The Bar for Vacant Raw Tag Team Championship. Hardy and Wyatt had control early on Sheamus. Cesaro hit the ring but was run out of the ring. Hardy nailed a clothesline and a neckbreaker on Sheamus for a two count. The crowd was LOUD with “Delete” chants. Cesaro distracted the referee, allowed Sheamus to drill Hardy with a big clothesline. Matt rolled to the outside, where Sheamus drilled him across the back of the neck and tossed him back in. Sheamus locked in a front facelock. He and Cesaro drilled Matt with stereo kicks in the corner, allowing Cesaro to garner a two count. The Bar followed up with a double clothesline. Sheamus drilled Hardy with a knee across the chest for a two count. Cesaro tagged in, whipped Hardy into the corner and nailed a big uppercut for another near fall. Wyatt was trying to rally Matt from their corner. Bray finally got the hot tag and looked good dishing out offense. All four battled. Cesaro and Hardy crashed to the outside. Sheamus set up for the Brogue Kick but was shocked by Bray doing the Spider-walk. He missed the kick and was caught with Sister Abigail. Bray elevated Sheamus into the air for a Twist of Fate from Matt, who then scored the pin on Sheamus. Your winners and new Raw Tag Team champions, Matt Hardy and Bray Wyatt! Good, solid match with good work from all involved. 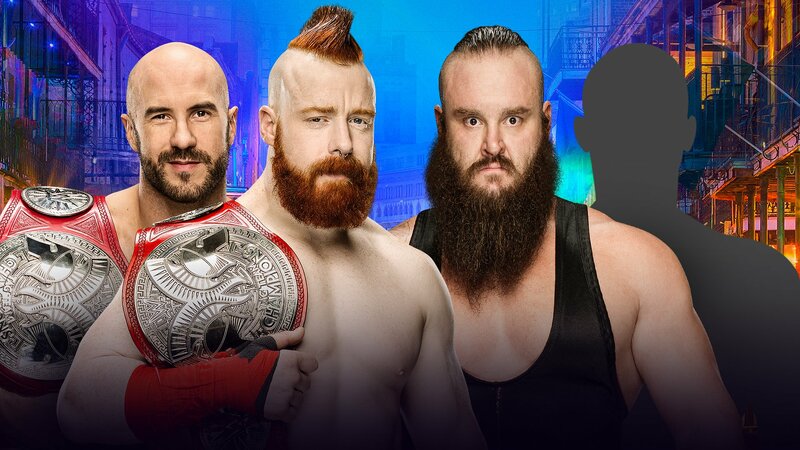 WE Raw Tag Team Title Match: Cesaro & Sheamus © vs. Braun Strowman & a child randomly picked out of the crowd. Strowman went right after the champs and beat them down. Cesaro chopped the legs from under Strowman and they hit a double suplex. Sheamus hit a knee drop off the top rope then Cesaro hit a front senton off the top of Sheamus’ shoulders. Strowman hit a double crossbody to the champs. Strowman tossed Sheamus over the top rope and landed badly. Strowman tagged in the kid who then tagged in Braun quickly. Strowman caught Cesaro and hit a powerslam for the win. Winner: Strowman & the kid. At WrestleMania, The Bar are heading to a whole new level. That’s because Raw Tag Team Champions Sheamus & Cesaro will be putting their illustrious titles on the line against Braun Strowman and a partner of his choosing. For the past year, Cesaro & Sheamus have firmly established themselves as Raw’s premiere tag team, overcoming every conceivable combination prior to The Showcase of the Immortals. The brash champions received a rude awakening, however, when they set out to battle The Miztourage on Raw, as Bo Dallas & Curtis Axel were suddenly joined by The Revival, Heath Slater & Rhyno, Titus Worldwide and Luke Gallows & Karl Anderson, and the resulting confrontation produced an all-out brawl that The Bar narrowly escaped. When Sheamus & Cesaro took issue with Kurt Angle, the General Manager decided to establish an impromptu Raw Tag Team Battle Royal to determine the titleholder’s opponents for The Grandest Stage of Them All. However, Angle almost certainly wasn’t counting on the Braun Strowman factor when he made the match, and The Monster Among Men shockingly emerged to punch his ticket to WrestleMania by reigning supreme over every tandem in the ring. The following week, amidst a sea of speculation, Angle announced he would grant Strowman a Raw Tag Team Championship opportunity at WrestleMania as a result of winning the Battle Royal, provided the Superstar could find a tag team partner. The Monster Among Men has wreaked has havoc on everybody and everything from the moment he came to Monday Night Raw, but who will the one-man wrecking crew select to be his partner? With the glory of a potential WrestleMania moment hanging in the balance, will The Gift of Destruction be willing to work together with anyone? Will The Bar once again rise to the occasion? Don’t miss WrestleMania, Sunday, April 8, at a special start time of 7 ET/4 PT, exclusively on the award-winning WWE Network! WWE Raw Tag Team champions The Bar vs. Titus Worldwide. The champions attacked before the bell. Apollo and Titus made a comeback with a double clothesline. The champs went to the floor, but Apollo hit a flying bodypress off the top to the floor on them. The announcers said Cesaro was favoring his leg. They finally hit the bell. Apollo was sent to the floor after Sheamus distracted him and Cesaro drilled him. Sheamus worked him over on the floor. Sheamus tossed him back in the ring and worked over Apollo in the champions’ corner. The Bar worked over Apollo, but he kept kicking up. Sheamus locked in an armbar. Apollo fought his way out of it and it sounded like the audience was booing his offense. He tried to make a tag but was cut off by Cesaro. The champions continued to control Apollo. Cesaro locked on a chinlock. Apollo fought his way out and it looked like he was finally going to make the tag but Sheamus tagged in and cut him off. Apollo still almost made it but Sheamus knocked Titus off the apron, leaving his partner with no one to tag out to. Sheamus missed a charge in the corner and nailed his shoulder on the ringpost. Titus made the tag and cleaned house. He nailed a big boot on Cesaro for a two count after knocking Sheamus to the floor. Titus went for a powerslam but Cesaro slipped down behind him and attacked the back of the knee. Sheamus tagged himself in and went for a move but was caught and hit with Clash of the Titus. Cesaro saved the day during a pinfall attempt. The champions went to the floor where Crews hit a flip dive to the outside. Titus was sent into the ringpost, leaving Apollo to fight two on one. Cesaro chop blocked him and scored the pin after a springboard move. Your winners and still Raw Tag Team champions, The Bar! Rusev is the first competitor followed by Finn Balor at number two. Rusev tried to eliminate Balor to start things off but Balor held on. Balor did the same thing. Rusev with a shoulder block but Balor landed a drop kick. Rhyno came in at #3 and went right after Rusev. Rhyno hit a spear in the corner then a front body suplex and same goes for Balor. There was an ECW chant going. Rusev hit Rhyno from behind to cut off the momentum and landed a heel kick. Baron Corbin was in at #4. And tossed Balor around the ring then hit a big boot to Rhyno. Corbin with a big clothesline to Rusev. Rhyno with a belly-to-belly suplex to Corbin then went for a GORE but Corbin hit Deep Six and tossed him to the floor. Balor tossed Corbin out after that. Corbin pulled Balor under the rope and tossed him into the barricade then hit End of Days to Rusev on the floor. Balor and Rusev are STILL in the match. Heath Slater came in at #5. Corbin took out Slater with a clothesline as Slater made his entrance. Elias is #6 and he sang a song for us to kill some time. Andrade Almas came in at #7. Almas kicked Slater on the ramp then started brawling with Elias and landed a back elbow followed by running knees in the corner. Almas went for his finisher but Elias got out of it and hit a big clothesline. Bray Wyatt was #8 and sent Slater into the barricade then hit a powerslam to Elias. Balor attacked Wyatt from behind but Wyatt cut him off with a clothesline. Big E was #9 and gave Slater some pancakes. Elias hit a big boot to Big E but Big E was able to hit a suplex to him. Rusev with a head kick to Big E. Tye Dillinger came in at #10 but he never made it to the ring as Owens and Zayn beat him down in the backstage area. Zayn replaced Dillinger and got into the match by beating down Balor. Sheamus was out at #11 and tossed Slater in the ring but as soon as he did, Slater clotheslines Sheamus out of the ring for the elimination. Wyatt hit Slater with Sister Abigail and eliminated him. Xavier Woods was #12. Woods went right after Wyatt and attacked him. Woods and Big E hit a double team move to Zayn then to Elias. Apollo Crews was #13 and went right after Wyatt. Wyatt went for his finisher on Balor but Balor reversed and hit a double footstomp. Shinsuke Nakamura was #14 and hit Zayn with a kick then a series of strikes to Wyatt. Nakamura eliminated Zayn with a knee strike to the gut. Cesaro was in at #15 and started hitting everyone with uppercuts. Kofi Kingston was in at #15 and he ran into an uppercut right out of the gate by Cesaro. Cesaro hit Crews with an uppercut to eliminate him. Jinder Mahal walked out at #17 and hit a suplex to Woods then a knee strike. Mahal would then eliminate Woods and Big E with a big boot. Seth Rollins walked out at #18 with new ring gear and hit a springboard forearm then a series of strikes to Balor. Cesaro tried to eliminate Rollins but it was Rollins who eliminated Cesaro. Mahal tossed Kofi out but Kofi’s right foot landed on Woods then Big E put pancakes under Kofi’s foot. Kofi launched off Big E and Woods back into the ring. Kofi head kicked Mahal out of the ring. Almas hit his DDT finisher to Kofi to eliminate him. Matt Hardy came in at #19 and had a stare down with Wyatt. Rusev attacked him from behind. Hardy and Wyatt teamed up to eliminate Rusev. Hardy hit the side effect to Almas then started brawling with Wyatt that led to their eliminations at the same time. John Cena was out at #20 and everyone attacked him as soon as he got into the ring. Elias went for his finisher but Cena blocked and tossed Elias to the floor for the elimination. The Hurricane came out at #21 and went right to Cena, who tossed him to the floor immediately. Aiden English was #22 and Adam Cole was #23. Cole had his ribs taped up but went on a kicking part to Balor and English. Balor kicked English off the top rope for the elimination. Randy Orton was #24 and hit a series of suplexes to Cole then went for an RKO to Cena but it was blocked. Almas went for a springboard dive but Orton caught him with an RKO out of nowhere then tossed Almas to the floor. Titus O’Neil was #25 and there was no reaction for him from the crowd. The Miz came out at #26 and hit Rollins with a neck breaker then got out of the AA and hit a DDT to Cena. The Miz hit Skull Crushing Finale to Cena then Rollins with a superkick to Miz. Rey Mysterio came out at #27 and hit a hurricanrana to Miz then sent Cole to the floor. Rey hit the 619 to Miz. Roman Reigns was #28 and hit Cena and Balor with right hands. He took out everyone. Reigns with a series of clotheslines to Miz. Reigns eliminated Titus. Reigns tried to do the same thing to Miz but was saved by Axel and Dallas. Rollins hit the Blackout to Miz then Reigns and Rollins powerbombed Miz out of the ring onto Axel and Dallas. Reigns then eliminated Rollins. Goldust was #29 and hit a series of strikes to Orton. Dolph Ziggler was #30 and went right after Cena. Ziggler with a super kick to Cena then Orton. Goldust cut him off with a slam but Ziggler managed to super kick him out of the ring. Ziggler with a Zig Zag to Nakamura. Moments later, Balor took out Ziggler with a forearm shot. We are down to six – Balor, Orton, Cena, Rey, Reigns, and Nakamura. They all start brawling. Cena with an AA to Balor while Rey hit the 619 to Reigns. Orton hit the RKO to Nakamura. Reigns with a superman punch to Orton for the elimination. Rey went for a 619 to Cena and Reigns and hit it. Rey with a springboard dive but Balor eliminated Rey. We are down to four and they start brawling. Nakamura hit a knee strike to the ribs of Balor, who then caught him with a head kick. Nakamura with some knee strikes but Balor responded with a drop kick to the face. Reigns hit Balor with a clothesline. Cena with some right hands but Reigns hit a samoan drop. Cena with a side slam to Reigns but Balor caught him with sling blade then a drop kick. Same goes for Reigns and Nakamura. Nakamura managed for his finisher but Balor blocked and Cena tossed Balor to the floor for the elimination. Cena tried talking to Reigns about teaming up and they did on Nakamura. Cena turned on Reigns and hit him with his signature moves. Reigns hit Cena with a Superman Punch then went for the spear but Cena blocked and hit the AA. Cena attempted to eliminate Nakamura but Nakamura blocked and hit a knee strike sending Cena to the floor. Nakamura and Reigns are the final two superstars. They exchanged right hands and Reigns hit a Superman Punch and sent Nakamura to the apron. Nakamura with a head kick and locked in a triangle choke suing the ropes. Reigns powered out of it and hit a power bomb. Nakamura blocked the spear with a knee strike and hit another one off the middle rope. Nakamura went for his finisher but Reigns speared him out of nowhere. Nakamura caught him with a running knee and eliminated Reigns! Cesaro and Sheamus beat down Rollins in the early going. The announcers brought up how Rollins may have tired out in the Royal Rumble match. Rollins mounted a comeback but Cesaro sent Jordan into the ring post before he could get a hot tag. Rollins took out Sheamus and Cesaro with an outside dive. Once back into the ring, Cesaro and Sheamus was able to double team Rollins while doctors checked on Jordan at ringside. Rollins went for a springboard move but it was reversed by Sheamus hitting a back elbow. Cesaro was tagged in and landed an elbow drop off the top rope for 2. Sheamus was able to hit a back breaker to Rollins for 2. After more double team, Rollins sent Sheamus into the ring post and Cesaro to the floor. Rollins with a slingblade to Cesaro then an overcastle off the middle rope. Rollins rolled up Cesaro for 2 then the Falcon Arrow and a superkick for another near fall as Sheamus broke it up. Sheamus now legal and hit a series of uppercuts and knee strikes. Jordan tagged himself into the match then out of the match as he is not himself as he holds his head. Rollins tried to fight both men but Cesaro caught him an uppercut. Sheamus hit Rollins with the Brogue Kick then hit their finisher for the win. Destiny didn’t quite bring them together, but Raw Tag Team Champions Seth Rollins & Jason Jordan are destined to be in for an incredible fight when they defend their newly-captured titles against former champions Cesaro & Sheamus at Royal Rumble. Following the injury to Seth Rollins’ Shield brother-in-arms Dean Ambrose, Raw General Manager Kurt Angle chose his son Jason Jordan as The Architect’s new tag team partner, and perhaps no one could have predicted that the makeshift pair would immediately take down The Bar for Team Red’s tag team crowns on a special Christmas night edition of Monday Night Raw. That miraculous victory didn’t exactly go all the way in uniting Rollins and Jordan, however, as the two Superstars have somewhat struggled to gel ever since becoming champions, despite continuing to fend off The Swiss Cyborg and The Celtic Warrior. However, with a title rematch against Cesaro & Sheamus at Royal Rumble on the horizon, can Rollins & Jordan find the rhythm they need to carry on as Raw Tag Team Champions? Or, will the trust and experience between The Swiss Cyborg and The Celtic Warrior carry them back into the championship circle? Find out when the Raw Tag Team Titles are defended at Royal Rumble, streaming live on WWE Network on Sunday, Jan. 28, at a special start time of 7 ET/4 PT. We go to the ring and out first comes RAW Tag Team Champions Sheamus & Cesaro. SmackDown Tag Team Champions The Usos are out next. The Usos work the mic on the way to the ring, talking bars. Sheamus and Jimmy Uso start things off and go at it. Sheamus drops Uso with a shoulder. They face off. Jey Uso comes in for some double teaming until Jimmy is back in as the legal man. They keep Sheamus near their corner with quick tags. Sheamus drops Uso and tags in Cesaro. Jey drops Cesaro on his head for a 2 count. Jimmy tags back in for a quick double team. Cesaro fights out of the corner and in comes Sheamus for some double teaming as the floor Uso. The Bar stands tall for a mixed reaction. Sheamus doesn’t see Jimmy tag in as The Usos double team him again. Jimmy goes to dive out but Cesaro uppercuts him instead. Sheamus ends up dropping Uso on the floor and bringing him back into the ring. Sheamus goes to the top and nails a flying clothesline for a 2 count on Jimmy. Cesaro tags back in for a boot to the gut as Sheamus holds Jimmy. Cesaro keeps Jimmy down with a crossface now. Sheamus keeps control of Jimmy and drops a knee in The Bar’s corner. Jimmy breaks free from a hold but Sheamus yanks him back into the corner and hits an Irish Curse backbreaker for a 2 count, preventing the tag again. Sheamus keeps Jimmy grounded now. Cesaro tags in and runs across the ring for a boot to Jey, knocking him off the apron. Jimmy goes to tag but no one is there. Cesaro ends up flooring Jimmy with an assisted uppercut as Sheamus covers for a 2 count. We get a replay. Sheamus with forearms to the chest on the apron now. Jimmy drops Sheamus’ neck down over the top rope as Sheamus wastes time. Sheamus tries to suplex Jimmy in from the apron but it’s blocked. Uso with an uppercut and a shot off the top rope. They both go down now. Jey tries to rally fans for his brother. Jey and Cesaro tag in a the same time. Jey unloads and hits a big Samoan Drop. Jey goes for the Rikishi splash but Cesaro moves. Cesaro follows up with a big uppercut. Jey is dazed. Jey counters a whip and backdrops Cesaro into the turnbuckles. Jey nails the Rikishi splash now and covers for a close 2 count. Jey drops Sheamus off the apron with a right hand. Sheamus runs in, allowing The Usos to double team Cesaro as the referee is distracted. Jimmy tumbles to the floor with Sheamus as Jey covers Cesaro for another close 2 count. Jey goes back to the top. Sheamus launches Jimmy into the barrier, distracting Jey. Cesaro charges and uppercuts Jey, bringing him down from the top. Jey slides out of a move and nails an uppercut. Sheamus hits Jey while the referee is distracted. Cesaro with the Cesaro Swing on Jey. Cesaro with the Sharpshooter now. Sheamus runs in and stops Jimmy with a Brogue Kick. Cesaro stops Jey from getting the bottom rope and tightens the Sharpshooter. Jey finally makes it to the rope to break the hold. Sheamus with another cheap shot as Cesaro distracts the referee. Cesaro floors Jey and covers for another close pin attempt. Sheamus has White Noise blocked. Jey drops Cesaro off the apron and sends Sheamus into the ring post. Jey comes off the top but Sheamus catches him in mid-air. Cesaro tags in for the double team White Noise. Cesaro with a 2 count on Jey as Jimmy breaks the pin just in time. The Bar launches Jimmy into the middle rope and he falls out to the floor. Sheamus is the legal man now. They go for a double team move in the corner but Jey fights them both with punches. Cesaro brings them down hard with a powerbomb but Jimmy runs in to superkick Cesaro. Jey with a close 2 count on Sheamus after a Samoan Drop. Fans chant “this is awesome” again. Jimmy reaches for the tag but Sheamus holds his leg. Cesaro is not on the apron for the tag. Jey drops Sheamus with a kick to the head. Jimmy tags in and they double superkick Cesaro. Sheamus misses a Brogue Kick as The Usos unload on him with superkicks. Jimmy leaps off the top and takes out Cesaro on the floor. Jey comes off the top with the Superfly splash on Sheamus for the pin. – After the match, The Usos take their titles and stand tall. We go to replays with The Usos celebrating. The Usos raise the titles as we see it’s now 2-2 for the night.